Once the league determines a field needs to be closed, it will be set to "closed" on the website. Once set to closed, the website itself will automatically send alerts to all affected teams. Saturdays: Coaches should tell their parents that standard procedure for any rained out Saturday games is to play them at the same time on the same fields on Sunday, the day after. In such cases, coaches should immediately reach out to their teams to be sure they can field enough players, and then to the opposing coach to be sure they can as well. If it is determined that a game cannot be resecheduled accordingly, the home team coach should immediately alert the field scheduler per below (see: How to Cancel a Game; Note, if playing the game on Sunday at a different time is possible, please add that information to the notes section of the form). 1. 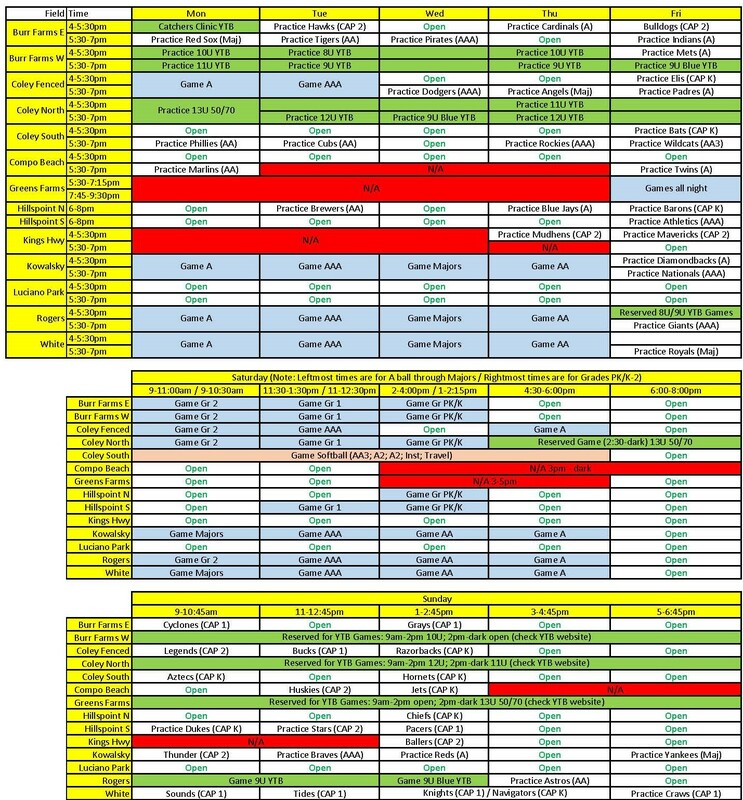 Click HERE to see a master field summary of what fields should be open on a given day week-to-week (necessary to avoid conflicts with non LL events that will not be visible on the LL master field schedule). 3. Contact the opposing coach of the affected game to figure out which of the dates/times/fields work for them as well. Note: One easy option is to use one of your practice times for a game instead. 4. Alert the field scheduler of your choice by filling out the form HERE. Once your game is officially rescheduled, the field scheduler will notify all affected parties (via automated alerts sent from the website), and alert the Umpire Coordinator. In weather related rainouts, the home team is responsible for canceling and rescheduling games. In all other instances (e.g. one team cannot field enough players because of a school event), the party in need of canceling the game is responsible for rescheduling it, or the home team if one team was not more in need than the other. Please alert the field scheduler when you need to cancel any of your games by filling out the form HERE. The field scheduler will then cancel the game and have the website send out notices to all affected. If you choose to not hold a scheduled practice, please delete this event yourself ASAP. Do to so, in your team schedule, click the red "X" next to the applicable practice. 1. Click HERE to see a master field summary of what fields should be open on a given day week-to-week. 3. Alert the field scheduler of your choice by filling out the form HERE. The cages are automatically reserved right before games for the teams playing in those games. At almost all other times, they are first-come first-serve. However, if a special occassion arises where a cage needs to be reserved (at the league commissioner, not team, level), that reservation will be noted on the master field summary HERE.